Well, I needed something reliable for the Charting assembly in the Silverlight Toolkit, so I checked with the experts (i.e., members of both teams) and came up with the following code that returns the correct value under both Blend and Visual studio (from DesignerProperties.cs in the Silverlight Toolkit source). /// to work around an issue. /// Stores the computed InDesignMode value. The good news here is that this mistake is trivial to detect during application development (failing to call the Initialize method always yields the wrong hash value) and it's also trivial to work around: simply call the Initialize method after constructing a new instance of one of these HashAlgorithm subclasses. In fact, if your application already does this (as my ComputeFileHashes suite does), then you are completely unaffected by this issue. As I note above, there was no need to update the ComputeFileHashes application binaries because they were written under the assumption that a call to Initialize was required - and therefore are correct whether or not a call to Initialize actually is required. I was working on a WPF project the other day and wanted an easy way to display data in a simple tabular format: a few columns (with headers) that would automatically size to fit their contents. The obvious choice was the ListView control and its GridView View which do exactly this. As you might expect, using this control was straightforward and it worked just like I wanted. Well, almost... There was one small catch: my ListView was hooked up to a data source that changed dynamically (via a Binding on its ItemsSource property) and I noticed that when the data source was updated, the widths of the columns were not automatically adjusted to fit the new content. Okay, so if you're still reading, then your scenario is probably like mine: changes to the data source can occur without the application explicitly knowing about it. That last bit may not make a lot of sense until you realize that it's possible to implement a great deal of an application's functionality entirely in XAML. 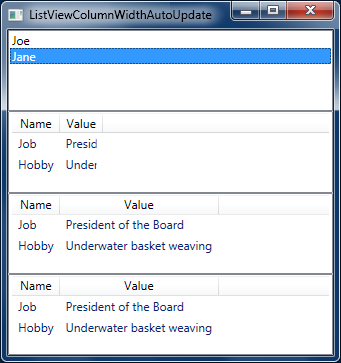 Specifically, it's quite easy to connect a ListView to the SelectedItem property of a ListBox so that changes to the selected item of the ListBox automatically re-populate the data in the ListView. Because this can be done entirely in XAML, these updates aren't automatically visible to the application. The solution for the slightly more complicated scenario begins by realizing that it's necessary to know when the ItemsSource Binding updates. Fortunately, this is quite easy in WPF! :) By setting the NotifyOnTargetUpdated property of the ItemsSource Binding to true and handling the Binding.TargetUpdated attached event on the ListView, we have a fairly simple way of generating an event that can run a bit of code that calls the above method to update the column widths. What's more, this technique is fairly designer-friendly because it gives the designer complete freedom to set up such cross-control Bindings in their XAML without having to be intimately involved with the developer responsible for the application's code. Granted, the developer needs to implement the handler for the generated event, but that code is completely general and can be reused across multiple different ListViews. In the case of the attached behavior solution to this problem, we make use of the DependencyPropertyDescriptor class to attach a change handler to the ItemsSource property of the ListView - and then call the method above to actually update the widths of the columns. There end up being a few more lines of code with this solution because of what it takes to create an attached DependencyProperty and attach/remove a handler for it, but that code is completely self-contained and can live entirely in its own dedicated class (whereas the method used by the previous solution needs to be part of one of the application's classes). More importantly, the number of XAML edits drops to just one and it's no longer even necessary that a Binding changes the data source - even direct assignments to the ItemsSource property will do! What's neat is how something that started out as a minor annoyance turned into a great learning opportunity! I haven't needed to use DependencyPropertyDescriptor before now, but it's definitely something I'll keep in mind next time something like this comes up. And while I've made use of attached behaviors in the past, I didn't initially think to use one here - my thanks go out to Marlon Grech and Dr. WPF for encouraging me to do so. As it turns out, I like the attached behavior solution best of all for its simplicity, clarity, and separation of concerns. I've incorporated this change into my project and now my ListViews are behaving exactly how I want them to! 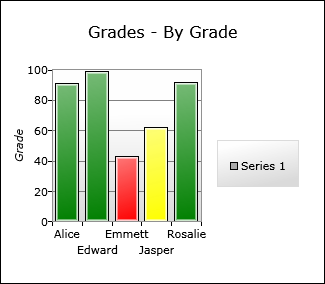 One of the fundamentals of column/bar charts is that the columns/bars of a single series are all drawn the same; that's what ties them together and makes it clear they represent a single series. If you create a column chart in Excel, the default color for the columns is blue. It's easy to change that color to orange or green or plaid, but by default all of the columns of the series change together because they're all part of the same series. (Incidentally, it is possible to change the colors of an individual column in Excel, but it's not entirely obvious how to do so and it's clearly not a mainline scenario.) With that in mind, it's no surprise that our charts behave similarly: you can provide whatever look you want for the columns and bars (via the ColumnSeries.DataPointStyle property, perhaps), but the columns and bars of a particular series always look the same. But what if your scenario is such that you want to do things a little differently and you want more control over the colors of individual columns and bars? Well, you take advantage of re-templating and Model-View-ViewModel (MVVM), that's what! :) You're reading this blog, so I'll assume you already know what re-templating is - if not, here's a good place to start. Model-View-ViewModel (MVVM) is probably less well known to date - it's an approach to application development commonly used with WPF and Silverlight where simple wrapper classes are used to expose aspects of the underlying data types in a manner that's easy for the UI layer to deal with. You can read lots more about MVVM on John Gossman's blog or this recent MSDN article by Josh Smith. But I'm not here to teach you what re-templating or MVVM are - I'm here to show you how to use them with Charting to implement the multi-colored column scenario! 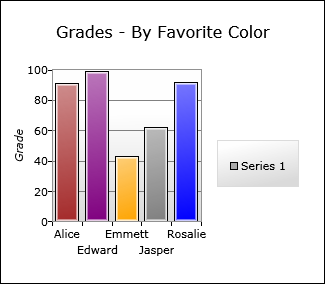 Title="Grades - By Favorite Color"
So that's how easy it is to get custom column and bar colors if your data objects already expose the information you need! But what if you want to base the custom colors on something that's not directly available on the data objects and you also don't have the freedom to change the data objects themselves? 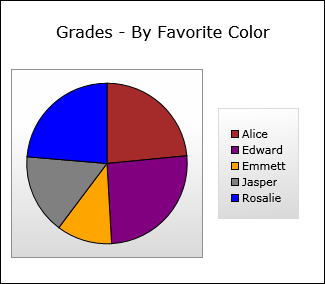 In other words - continuing the example above - let's say we decided to change things so the columns are colored according to each student's current grade: great grades get green columns, satisfactory grades get yellow columns, and unsatisfactory grades get red columns. Aside: I've typically seen view model classes implemented by re-exposing each of the interesting data object properties - so for each property Foo on the data object, there will be a property Foo' on the view model object (which is either identical to the original property or some derivative of it). While I can see the value of this approach in some cases, the duplication of properties always bothers me and so I've instead exposed the entire Student object from the StudentViewModel object as a property (along with the new GradeColor property). This saves me from duplicating any existing properties, exposes the entire Student object to users of the StudentViewModel object, and is completely future-proof because any updates to the Student implementation will automatically show up for users of StudentViewModel. I thought about a few ways to work around this, but eventually decided the fix (the setting of the DataContext property for the fake PieDataPoint) belonged in the Charting code itself. Fortunately, Charting is open source, so it's easy for anybody to make such changes if/when the need arises! I've included a copy of the relevant source file with the one-line change I made (Changes\PieSeries.cs, line 317) and changed the sample project to use a custom build of Charting's Microsoft.Windows.Controls.DataVisualization.dll assembly that includes this change. And there you have it: a few simple ways to take Charting and extend it to do exactly what you want! The examples here are fairly simple, but re-templating and MVVM are very powerful concepts which enable a high degree of customization for Silverlight and WPF applications that's pretty hard to come by in other platforms. If you're trying to do something unique and you're not having any luck the "normal" way, please take a few moments to consider the techniques discussed here - you may find that your problem has an easy solution after all!